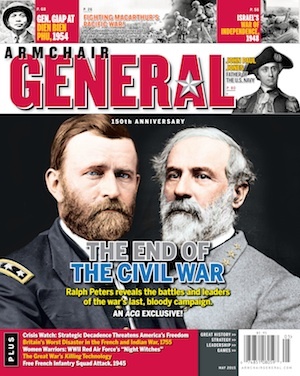 10 Questions for General Hal Moore | Armchair General Magazine - We Put YOU in Command! An exclusive interview with the hero of the Vietnam War’s 1965 Battle of the Ia Drang Valley and co-author of We Were Soldiers Once … and Young. 1. ACG: Why did you and Joe Galloway decide to write We were Soldiers Once … and Young? 2. ACG : Why do you think the book is so popular? GEN. MOORE: Because of the detailed research, the extensive interviews with the troopers, and the quotations in the book. If one looks at the chapter notes alone, they convey the amount of research we did. On the weekend it was published, it was reviewed on the front page of the New York Times book review section. We knew then it was going to be big, and we quickly received calls from producers who wanted to make it into a movie. 3. ACG : Did the film accurately capture the battle’s horror? GEN. MOORE: The movie version was very accurate. For example, it captured the fact that Soldiers in battle fight, kill and die for one another. It also properly recorded the respect that I had for the capabilities of the enemy we fought against. However, the film failed to capture the factual account of the telegrams arriving home dealing with the deaths of our troopers. At the time, the Army did not have a system set up like it has now, and the telegrams were being delivered by taxicab drivers. My wife, Julie, found out and raised hell with the Fort Benning post commander. From then on, Julie followed the taxicab to the home and was on the scene when the widow got the message. Soon, the Army devised a system to have the telegrams delivered by a chaplain and another officer in uniform – that was all because of Julie. 4. ACG : What were your emotions when you first saw the film? GEN. MOORE: The first time we saw the movie, we were quite moved. The motion picture was extremely well done. It really captured the essence of battle, especially the scenes dealing with everything that was happening at the command post. That really happened, and it was accurately depicted. 5. ACG : What did it mean to have actors like Mel Gibson and Sam Elliott tell your story on film? GEN. MOORE: Mel did a great job. My daughters tell me that when he was talking in the movie, they could shut their eyes and hear me. Sam Elliott also did a beautiful job playing Sergeant Major Basil Plumley – he should have received an Oscar. Here is an outstanding leader. I retired from a metro plice department and this type of leadership is in short supply. I concur. I am currently in my 28th year in law enforcement. I teach a block on Servant Leadership and refer frequently to this story and LTG Moore. Great American, Great Soldier, Great Leader. Please contact me. I am very interested in the servant leadership block that you teach “peace officers”. I am president of a manufacturing company in Arlington Texas and also use Hal Moore as an example of servant leadership in our business as I mentor and coach. Leadership is the glue that holds a team together and Hal Moore exemplifies this in every way. As a former army officer this is close to my heart. Will General Moore receive visitors at his home in Kentucky? Having been a soldier once and young I have read much of what has been said by servicemen on thier commanders, I have yet to discover a sheer loving for a man even after a time when death was a constant companion. Seargent Major Basil Plumley would have been commissioned into our forces here in the UK and allowed to reach the rank of Lt.Colonel, as for General Moore ? Clearly the Lord made a special child the day he entered the world. A lot of men stayed allive for his sheer ability to read the unreadable to understand the impossible . sgt major plumly, was a true sgt-major. i can think of 3 at least and 1 in particular that i feared more than the russians, the IRA, the shithole that was bosnia and the iraqi’s. good bless you WO2 SGT MAJOR GLEDHILL. he kept us alive. I am using Hal Moore as the subject of a school project called History day, and recently discovered, Hal Moore is related to me. But would like to know the name of whoever wrote this article, I need the name for an annotated bibliography. I teach a course in the Civil War at an adult learning center here in Seattle. On the second day of the Battle of Gettysburg, Col. Johusa Chamberlain ordered his 20th Maine to fix bayonets and at his order, come out of their defensive positions on Little Round Top and charged down the hill to the complete surprise of Confederate Col Oates and his 15th and 47th Alabama. The result was the capture of 400 prisioners and the resulting safety of the Union left flank. My understanding of the last day at the Ia Drang Valley is that your troops performed the same or similar maneuver. To me the comparisons appear to be more than co-incidence, as Chamberlain’s tactic of the small unit in defense is still taught in most of the major war colleges in the world. I would sincerely appreciate your comments and my sincere thanks for your contributions and service to our country. BODARD (Lucien), La Guerre d’Indochine, 4 vols. A good if somewhat long history of the Indochina war written by one of the best French journalist to have covered the war. It should be noted however that Bodard’s main strength comes from his ability to capture an ambience rather than from factual accuracy. An abridged English translation of the first two volumes has been published as The Quicksand War (Boston: Little, Brown, 1967 ; London: Faber, 1967). to seek permission for use of some of his leadership principles quotes, and perhaps his image as well for a motivational poster business I wish to start. I am a teacher of special education students in Washington state. We read a book called “Fallen Angels” every year and I show the movie “We Were Soldiers” as a visual text as a companion to the book. The students were so taken with your statement about being the first one on the battlefield and the last one off…and the actions that backed up that statement, that they would like to write to you and express their thanks and emotions. Where may I address their letters so that you may read them? Please pass on to General Moore my sincere appreciation for his service and his leadership. I have the utmost respect for his refusal to leave his men in the middle of the battle. That is a man worth serving under. He and his men went above and beyond the call and gave their all for a country that showed so little appreciation for what these men did. I am very proud on all of them and as a Vet that served in Vietnam, I know the price many paid to answer their countries call. I honor all the men and women that serve in our armed forces and put their life on the line so that we sleep well, at night. God Bless all of them and may they return safely to their famlies. Does the General agree with current troop deployment in Iraq and Afganistan as to the rotation of Battalions in and out of the theatre and its confusion created by constant retraining of the troops? Also does the General have any thoughts about the instant communication between troops and their families back home and the effect on the troops physchologically as compared to other actions such as WWII, Korea and Viet Nam. I was an Airman Second Class in the United States Air Force assigned to Tan Son Nhut Air Base as an Air Policeman and was one of the gunners that flew with the U.S. Army on UH1D helicopters gunships. We took off that day on a routine four hour mission and returned 3 days later after we were diverted to the Ia Drang valley into that battle. It was the most fierce and awsome display of American will to win and never give up I have ever seen or ever will see. The bravery of the soldiers under General Moore’s command and his leadership have lived in my heart and mind since that day and although I have rarely ever spoken to many of it, I can never forget what I saw there. It has been and always will be the most significant event in my life. By the second day of landing in the hot LZ and evacuating wounded I thought our next mission might be our last and questioned my wisdom in volunteering, but never thought of not returning for another run. I have often thanked God for those men and sparing me my life. I saw General moore only briefly while he was commanding the forces that day but never forgot that image. I always wanted to meet him and thank him, but I guess I was too low in the chain for that. I was so inspired by that event that even though I was wounded in March 1966, I went on to retire from the Air Force in 1982 but never stopped thinking of those 2 to 3 days that tested me along with those Soldiers. It also tested my relationship with my Vietnamese wife to be at the time when I didn’t return that day she was sure I was one that also perished. We have now been married for 45 years. We both cried when we saw that movie and the memories it stirred. I sincerely hope General Moore and his family are fine and continued to be blessed. A deserving Officer and a gentleman whom I always will admire. I am studying American History at college, part of it relates to the Vietnam War, it was suggested we watch films related to this dreadful war, I choose to watch `We were Soldiers’ as it was based on true events. After viewing the film it gave me a greater understanding of what the people went through. I was moved by how brave these soldiers were and horrified by how many people died as a result of the war and the horrors of the war itself. The men that so bravely fought this war will forever be heros and a lot of them unrecognised heros. Thak you for giving the world an insight to this dreadful period of time. I would like to send LTG Harold Moore an e-mail. I know him from t-day plannning. I would gladly follow Col Moore, General Swarzkopf, or General Patton to the gates of Hell if required. Never has there been a true American hero like Colonel Moore who loved his trrops as he did. Although I served in Vietnam as a Marine in Da Nang (VMA-(AW)-242, MAG-11, 1st MAW) in 1969 and 1970, I never knew such a leader as Colonel Moore. God bless Colonel Moore and the brave soldiers who served with him during the Ia Drang Campaign. They are all American heroes that will never be forgotten. General Hal Moore Your speech on Leadership.Thank you for passing on your secrets of sucess..your speech has help me. General Hal Moore I was a child when the Vietnam War was going on..I saw the war on T.V. I found a site on the computer: The L Z Sally Poetry Page, has alot of good poems from Veterans.. Integrity, loyalty, honour, courage and selfless commitment. Words with meaning to those who answer the call of duty. I had the honor and the privilege to serve with the First Cav based in An Khe from December 1965 to December 1966. Unfortunately, our paths never crossed which I regret. I served with the 11th Aviation Group and actually ran the radio relay operations which as you know allowed for proper transmissions to be made from forward position back to AnKhe. It was a job that basically ostracized me from my fellow mates both then and to this day when we speak at any sort of group function. I pretty much spent my time with two other Americans and a squad of South KOREAN soldiers that were our security. I still deal with issues to this day but always am thankful I served with the finest people ever created. Thank you for all that you gave and also thank you to Mrs. Moore for all that she gave as well. I have tried to contact Joe Galloway, MSGT Plumley and Brad Crandall as well to just say I am grateful to have shared the same planet with them. God bless you. thankyou for seving my brother in arms! watching movie right now-amc.one hell of a masterful depiction of the battle. great acting and all the best to all of our brave soldiers-then and now in afghanistan and iraq. General, as many have i as a desert storm veteran found it hard to sit and watch. I relived so much knowing the accounts portrayed were so factual. I do honestly thankyou sir, keeping this spirit alive is so important. I would have followed you in heart and deed. May the God of our fathers bless you and sir…i thank you for my freedom. I consider the story of Ia Drang, in which Colonel Hal Moore and 395 men held off an entire division of NVA soldiers and Viet Cong soldiers, to be one of the greatest stories in all of world military history. I know not how, even though I have read the story, Moore and his companions did what they did. Every time the movie about the battle is on TV, I end up watching it. The battle of Ia Drang shows once again the unbelievable tenacity of the American spirit. Is it possible that the American spirit derives from the strength of spirit of the original European-Americans, who came to the continent to escape what they felt certain was tyranny, and that that strength of spirit had a genetic component? I don’t know, but I have seen Americans do things impossible so many times that I have begun to suspect it. I am not a “love it or leave it” American, But I do believe that if someone really truly does not love our country, they might help themselves if they really consider, calmly and dispassionately, if they might be happier by going somewhere else. At a company lunch one day, I sat around a table with workers of all ranks, and discussion turned to Viet Nam, and everybody agreed it was a mistake. I stated that I thought it was OK to believe that, but I hoped they would always remember that when the Americans finally left once and for all, the South Vietnamese jumped into the water and swam after the ships. I’m grateful to be an American. I’m grateful that the Americans tried to free the South Vietnamese once and for all. In trying to effect what I believe was a noble goal, the United States military lost just under 58,400 people. The enemy lost approximately one million persons. And the story of Colonel Hal Moore and his 395 combatants speaks loudly and clearly for the whole world the message that if Americans go anywhere in defense of freedom, freedom in the form of government of the people, by the people, and for the people, will be well defended. At the same time, I hope we always try to exercise better judgment in choosing whom we decide to fight, and that we utilize diplomacy until nothing is left to use but “diplomacy by other means” (ie, war). I enlisted in the Army 10/29/1971 en-route to Fort Ord, Ca. For Basic Training. H-4-3 while there Major General Harold G. Moore was Commanding General of fort ord. After basic training and a.i.t. I was en-route to Vietnam, but at Oakland Ca. Deverted to the Berlin Brigade B-4-18 Inf. Well not to change the subject, prior to this. My brother was in Vietnam in 1965, arrived on the U.S.N.S. Geiger in September. Unit, D-2-19 Artillery later B-2-8 Cav. while in this company,my brother Salvador H Ledesma private/ R.T.O. and Sgt. Harold Sund and a Lt. en-route to special forces camp Plei Me with supply and re-inforcement they were ambushed by the n.v.a. 10-18-1965 The attack on the special forces camp was on 10-19-1965 all this happen before the Battle of Ia Drang Valley. As a Iraqi and Afghanistan Vet I thank you for defending our freedom and leaving no one behind which is now part of the Army Values that I retired from in 2010. You are a inspiration to all of us Anericans of someone who never gave up and never accepted the three strikes and you are out. GARRY OWEN GENERAL and GOD bless you and your late wife Ms. Jullie who because of her the Army set up the family support groups that exist today! I have a very good friend that is a retired Navy enlisted man. I would like to give him an autographed copy of the book. I would be glad to send it to you if you would sign it for me. Thank you for your service and your consideration for my request. I will forever be greatful for the men that have faught for our freedom and others. I was just a kid of 7years old at the time these men were fighting. I thank you all for a wonderful life, your my heros. no man live behind SIR!!!!!!!!!!!!!!!!!!!!!!!! Sir, would you do me the Great Honour of looking at my son’s website. Kevin is only 10 years old and live in the UK, last year he made a website about the “Huey” helicopter, the feedback from Vietnam Veterans was fantastic. This inspired him to make a 2nd website, to honor Vietnam Veterans. Kevin is also a ” Honorary Assistant Crew Member” on the only flying “Huey” in the UK. Kevin would be “Over the Moon” if you looked at his website, and if you was to contact him via the website…….well, he would be in “Heaven”. Happy birthday! Am retired Army, a Coloradan (skied at Crested Butte) and at 58 went to Afghanistan for deployment. Watching “We Were Soldiers and Young” after my deployment made it much more real. Wish I could have served under you but am glad so many had the privilege. Imagine Japan was an interesting assignment as was Norway. Truly, at this point in history, I wish we had leadership like yours at the top. We need it so badly. Take Care and thanks for all you have done. I had the privilege of serving at Ft Ord, CA in March 1971. My Basic Training company commander Cpt Thomas F. Fitzgerald who became Gen Moore’s ade-de-camp later that summer took the time to introduce me to the CG. I was impressed with him then and knew nothing about what he and his great soldiers had done in the Idrang valley. I never would have known the as a new Private in the Army that I two would make a career out of the service. But I have now been retired 21 years and feel like the movie and book title We were soldiers once and YOUNG. I salute every soldier of the Idrang Valley. You and my Dad would have understood each other! He was : Captain ( while in combat ) John K. Benfield , Jr. He was Captain of: K-Company, Second Battalion, of the 5307th Composite Unit , Provisional. Named ” Merrill’s Marauders ” by the Wartime Press. He and yourself had incredible experiences-so much so that most “people”of today’s world would not believe the thing you saw in war. My Dad knew you and was one of the Huey Helicopter pilots that was non-medevac that came in to help out with the injured and those needing immediate attention. He was also the pilot who came back to pick up what was left of the helicopters to use them as spare parts. I didn’t know this until I watched the very moving move “We Were Soldiers.” Dad doesn’t talk much about his two tours in Vietnam and the only way I find out anything is to ask him a generalized question about it — one day I asked him if he knew you. And that’s when he opened up – at least about the Il Drang battle. Then he sent me some records that were copied out of his 201 File, once he retired. This is how he now speaks with me about his tours in Vietnam. Through those records. He knows I will research the incidents and find out just what all he went through while he was there. Dad turned 86 this month, and I am so very proud to have him as a father. He is my own personal hero as I was old enough to know what was going on when Vietnam occurred. He’s a 3 war veteran. His name is CW4 Forrest E. Myers (US Army Retired). I don’t expect you to remember him, but just in case you do. As a veteran of the Viet Nam War Era, I watched the movie “We Were Soldiers” with honor to the ones who fought in that war; sometimes with tears in my eyes. I wanted to serve with the men in Viet Nam but was not allowed to go being the only one to carry out the family name. I want to say thank you to all that served there during a time that was difficult for this country and their families. Lt. Col Moore and his men were heroes in my eyes and the movie represented well the actions that were taken there in Viet Nam.We need more commanders like him who really cared for his men and the mission at hand. Again I say thank you to the men who served during a crucial time in our history. I would like to thank the men and women who are serving their country now and say they are also heroes. They are serving in a difficult time for our country and I say thank you from the bottom of my heart. May God watch over you all and keep you safe and bring all of you home to your families real soon. E visto la pelicula realizada por Mel Gibson , donde muestra un realismo impresionante . And seen the film by Mel Gibson, showing an impressive realism. God Bless You Sir, and all that have paid the sacrifice for our freedom. I would like to get in Contact with you because of what might sound absurd. I believe my last incarnation died at the battle at Ia Drang. I’m trying to find out more abou it. I died there killed by three shots in the chest an one in the head I guess. I guess you are the only one who can help me with that and can understand why I have to find out about it. I am saddened to report that CSM Basil Plumley died this month on 10-10-2012 of cancer. He was LTG Moore’s CSM in the 1st BN 7th Reg in the Idrang Valley. He served in three wars and was a true soldier and American Hero, still caring about the soldiers at the age of 92. I salute your memory and am one American who will never forget him. YOU ARE AN EXEMPLE OF COURAGE! I never knew if Lt.col hal moore was still existing to give this interview[sorry to say so,]but one thing i know for sure,he is part of american history that shaped the world especially in vietnam war,my entire attention of Lt.col moore was when for the first time watched the movie we were soldiers by mel gibson nearly a decade ago but its still my favourite one forever it will be,i just can’t get tired watching it over en over again.. love the way he give his speech to his sevices men,his memory quotes,most interesting one is when sgt.maj plumly says to Lt.col moore,hellow sir when he replied,so what are you,a f*****g wheather man. I watched your original movie today, as I do every year since I purchased the CD (with a tall glass of Jack Daniels). I still find it to be one of the only real movies made that brings out the true realism of the war and yet gives Mr Charles his correct value. I spent a year near Hue in the 101st ABN in 68 and always considered the CAV as brothers. I would hate to relive that time again but I wouldn’t trade the value received for the experience. I hope this finds you in good health; you are extremely respected and admired. P.S. We met in and shook hands in Crystal city when my Dad’s Association (5/7th CAV) hosted a reunion celebration. You are a very modest man & Soldier. I am a Vietnam veteran, platoon leader, Bronze Star. I have read the book several times. I am struck with the lack of intelligence and the lack of planning by Col. Tim Brown, who dispatched LTC Moore’s entire battalion into an area where the NVA strength was unknown, where an entire NVA regiment was regrouping. Yet, Col. Brown was promoted to BG. My only guess is that for Gen. Westmoreland to relieve Brown of his command would have been to admit that a huge tactical mistake was made. Does anyone have any further information? Thank you. You are,as I am sure you’ve been told the greatest Military leader in recent history. I only wish when I served I was under the command of a Col. like yourself! served during mostly peace time,but trust me at my word Sir,I would follow you thru the gates of hell! Thank so vwey much for your service Sir,I salute you! we ever get over it or do we just Soldier on? At the outset, let me just say I really enjoyed the movie. I know it’s a small thing and really nit-picky, but when it came to the scene with the guys playing cards in the wash of the helicopters, I actually said aloud in the theater, “Oh, crap!” With all those technical advisers hanging around the set, why didn’t anyone notice the ARVN soldiers wearing their maroon berets pulled down on the wrong side of their heads?! English/American style is to pull the beret down on the right side, but the Vietnamese traditions came from the French Army. French/Vietnamese style is to pull the beret down on the left side.